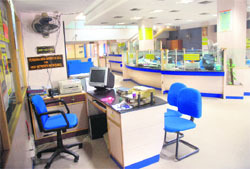 Various trade unions, including the AICCTU and the CITU, supported by the clerical staff in the banking sector, caused inconvenience to the public here today. The Punjab and Haryana High Court today ruled that Mohali’s former Deputy Commissioner (DC) and the Registrar of Documents did not bother to protect public property. It also called for details of sale deeds relating to ‘shamlat deh’ and ‘jumla mushtarka malkan’ land in Zirakpur, Dera Bassi and Mubarakpur. In a development towards assigning more powers to AGMUT-cadre IAS officers in the Chandigarh Administration, Prerna Puri, a 2006-batch officer, was assigned the task of secretaries of the departments of information technology (IT) and house allotment today. What a waste, every year! Every year, all 35 councillors are provided luggage trolley bags for carrying a ‘truckload’ of their agenda items for the General House of the municipal corporation (MC). 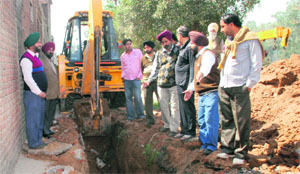 As many as 36 commercial structures constructed illegally in various places were demolished by the enforcement wing of the Greater Mohali Area Development Authority (GMADA) today. Theatre for Theatre marked their participation in the ongoing TFT Basant theatre fest with a brilliant presentation of the Punjabi version of their Hindi play Chehrey at the Randhawa Auditorium. The Government Medical College and Hospital, Sector 32, is all set to have a mobile unit with facilities of mammography and ultrasound for the screening of breast cancer. The hospital has already placed an order for the unit after the Chandigarh Administration sanctioned Rs 1.60 crore for the purpose. 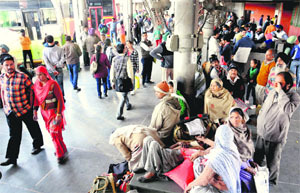 Harrassed passengers at the Sector-43 bus stand in Chandigarh. The Vigilance Department of the UT police will issue a look-out notice for two persons who led Amit Garg to Sector 17 police station along with his mother’s body. As part of the ongoing enquiry into Amit’s suicide in Ambala, the department reviewed the 70-second long CCTV footage of the Sector 17 police station where two persons were seen accompanying Amit to the police and gesturing behind his back. ASI Deshraj of the proclaimed offender special team of the UT police has been repatriated to his parent state Punjab after being found guilty of taking Rs 3,000 as bribe in connivance with head constable Vajinder Singh. While Deshraj is on the run, Vajinder has been nabbed by the CBI. An employee of a contractor of the Greater Mohali Area Development Authority (GMADA) was allegedly beaten up during the laying of a stormwater pipe in Industrial Area, Phase IX, here today. Aiming at sharing best ways for harnessing solar energy and addressing critical issues for implementing solar technology in City Beautiful, a one-day seminar on “Chandigarh- Solar City of the Future: Planning and Implementation” was held at the UT Guest House, here today. The search committee constituted for the selection of new Vice Chancellor of Panjab University, Chandigarh, has come under the scanner with questions being raised on the issue of propriety. Former Ambassador IS Chadha, who is one of the members of the panel, happens to be an active Panjab University-nominated senator. Team Chargeurs Phoenix, a team of 11 students of University Institute of Engineering and Technology (UIET), Panjab University, Chandigarh, won the first prize in a national-level motor sports event “BAJA SAEINDIA-2012” held in Indore. The Central Scientific Instruments Organisation (CSIO) celebrated National Science Day today by holding an “Open Day” and organising a special lecture for its scientists and staff members. All labs of the CSIO remained open for the general public. With hardly two days left for the CBSE examination, councillors are busy giving tips on how to attempt question papers. Making the college proud, Akshi Chawla a psychology student of MCM College, bagged the coveted fellowship under YIF 2012-13. The YIF fellowship is offered to 50 students from various academic disciplines across the country. Deepak Kaushik won the Panjab University Staff Association (PUSA) elections to the post of president after defeating Dharam Pal Sharma who has remained PUSA president for over two decades. While Kaushik secured 322 votes, Sharma managed to bag 273 votes, meanwhile the third contender for the presidential post Jaswinder got 196 votes. Didar Singh Bhatti, PPP candidate from the Fatehgarh Sahib Assembly constituency, who along with his son and supporters, was booked in three different cases for thrashing supporters of SAD candidate Prof Prem Singh Chandumajra, has threatened to take to roads if the police and SAD leader harassed him or his supporters. In the infamous case of gangrape on wheels here, in which two students had raped their friend’s minor sister, one of the accused, Marshal Arora, today withdrew his application to turn prosecution approver. The special investigation team (SIT) of the Chandigarh Police arrested Brig Rajbir Singh Khanna (retd) of the Silicon Global Education Immigration Company here today. A 19-year-old student was injured after three persons tried to rob him, near the railway track in Ram Darbar, here today. A case has been registered. Victim Kuldeep was stabbed with a knife by the three accused with a motive to rob him off his mobile phone and money. Chandigarh, February 28 The crime branch of the Chandigarh Police arrested Deepak Kumar of Sector 38 on January 27 and recovered 30gm charas from his possession. A case under Section 20 of the NDPS Act has been registered at the Sector 39 police station. The opening edition of the World Series Hockey (WSH) tournament might not witness the star players of Olympic qualifiers playing in the event, but the city fans are all set witness the faster version of the game. The Chandigarh Senior Men’s State Football Tournament is scheduled to begin at the football stadium in Sector 17 tomorrow. As many as 13 teams have confirmed participation. Punjab defeated Himachal Pradesh by 84 runs in their last North Zone league match played at the SSCB New Delhi ground to qualify for the knock-out stage of Vijay Hazare Trophy. Winning the toss, Punjab skipper Harbhajan Singh opted to bat first.